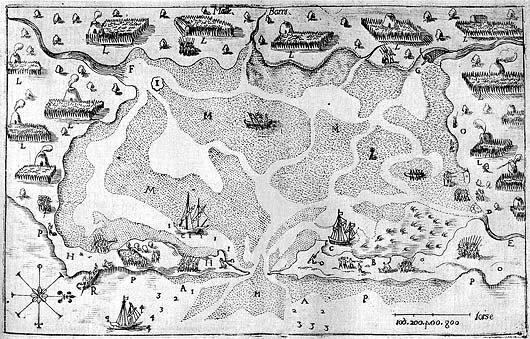 Champlain's map of Malle Barre, 1605. "Before reaching their wigwams we entered a field planted with Indian corn ... The corn was inflower and some five and a half feet in height. There was some less advanced, which they sow later. We saw an abundance of Brazilian beans, many edible squashes of various sizes, tobacco, and roots which they cultivate, the latter having the taste of artichoke. The woods are full of oaks, nut-trees, and very fine cypresses, which are of reddish colour and have a very pleasant smell. There were also several fields not cultivated, for the reason that the Indians let them lie fallow ... Their wigwams are round, and covered with heavy thatch made of reeds. In the middle of the roof is an opening, about a foot and a half wide, through which issues the smoke of their fire." Nauset Harbor is now part of Cape Cod National Seashore. Visitors can follow the Fort Hill and Nauset Marsh trails in Eastham to get a sense of what the French saw in the landscape. Visit the Salt Pond Visitor Center to learn more about the history of the area.